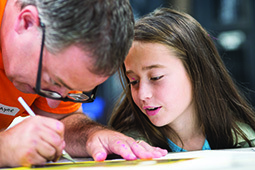 Family Art JAMs | The Fralin Museum of Art, U.Va. These popular programs combine age-appropriate tours with hands-on art activities that make the Museum's exhibitions accessible to children. The introduction of new art materials and techniques challenges children to think in new ways, and interactive tours help them develop the confidence to talk about art. By asking parents or other adult family members to serve as assistants, models, and collaborators, Family Art JAMs create an enriching experience for the whole family. Thanks to our generous supporters, Family Art JAMs are now free!